I have a funny food story to tell. Our family as with any family has traditions and one of our traditions was cooking this Spanish (at least I think it's Spanish) dish that we call Bacalao every Good Friday. So what is Bacalao? For us it's potatoes, tomatoes, peppers, onions and some kind of fish (usually canned tuna) arranged in layers and baked until tender and that was what we eat the whole day on Good Friday (because we can't eat meat). The funny thing is that Bacalao turned out to be dried salted cod and now that we're here in the US and bacalao is available at our grocery.. we're utterly terrified in trying out the real thing. So without further ado we would like to share our "Traditional Good Friday Baked Bacalao without the Bacalao"
2. 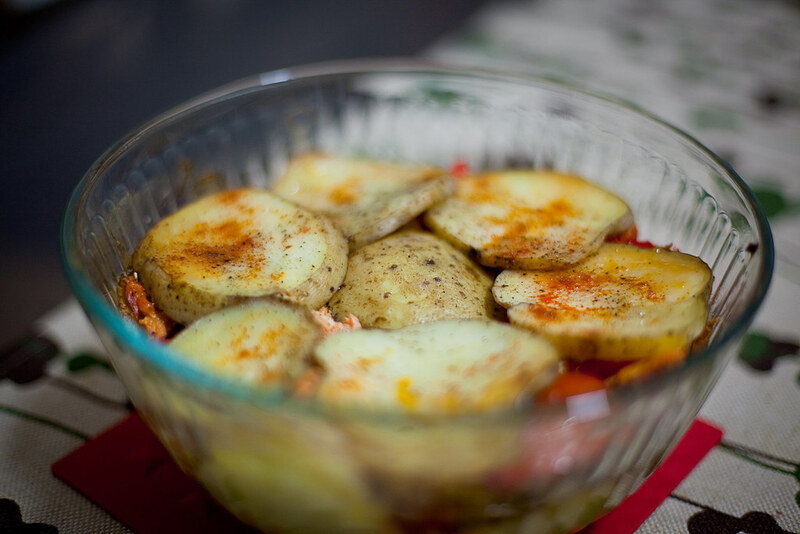 In a deep oven-safe dish, begin to layer the potatoes, onions, tomatoes, peppers and fish. 4. Repeat the layers until the dish is full. Hope you enjoy and have a blessed Holy Week!